Starting on Wednesday last week, I attended a big conference in Salt Lake City and saw a lot of people I haven't seen in a long time. One which way or another, my diet became a topic of conversation again and again. She was very interested in my diet and wondered what it consisted of. A friend saw me and noticed I'd lost weight and we talked about it. Later, I opened my lunchbox with a meal I had prepared - JulieMarie Christensen calls it a Burrito Bowl - and I got lots of comments from passers by. One look and they knew it was a healthy meal. And when I told them how much weight I'd lost, that prompted some conversations. I sat in front of the editors of the news magazine where I first saw the before and after picture and read the story that started me on this whole journey, so I wanted to tell them thank you and we got talking about it. Today I attended a meeting and heard about some pretty serious health situations and surgery for a colleague with problems not all that different from mine, and I was thinking how much benefit might come by following a WFPB diet for this person, how it might have even prevented the need for surgery. I'm really just getting started - though it has been four months almost - because of how much I have to lose to get to a healthy weight. But 40 pounds is impressive, at least it sounds impressive - and I wonder what it will be like when it's 80 pounds, then 100 pounds and so forth. People want to know how I did it. What is it like? What do I eat? How do I feel? So I thought I'd write the answers to these questions to clarify for myself and anyone else who wants to know. HOW DID YOU LOSE 40#? First of all, it is a lot different than the traditional vegan diet because there are things we avoid besides meat, dairy and eggs that are not good for you. It is NOT a raw food diet - I cook a lot of my food. I DO NOT FEEL DEPRIVED. I eat a LOT of food! I do cook a lot. Most pre-packaged foods have no-no ingredients, so I am cooking a lot more than I ever have before. Preparing recipes in advance and dividing them into portions and refrigerating/freezing them saves lots of time. My grocery bill is LESS than before. great in baking recipes etc. LABELS - I eat things in cans and boxes and jars, but not without reading the label. When the ingredients are beans, water & salt - then I can eat it. When there are lots of good things, but also "spices" or "natural flavors" or "citric acid" - they are adding things that may have at some point been derived from real plants, the processing is anything but natural and intended to super charge the flavor, making it addictive and making real food taste bland by comparison - this is what you want to avoid. I kind of go through phases. I usually eat a whole grain pasta or brown rice or a potato with lunch and dinner. Alternatively, I will eat corn tortillas, corn, oatmeal, bread, whole wheat tortillas as one large portion of my meal. Then I have beans or tofu, vegetables and some sauce - or maybe a green salad with dressing. I have been eating a lot of hummus, salsa, and tortilla chips I bake myself, or potato chips I bake myself. I've tried several of the recipes on ProtectiveDiet.com and find them yummy and satisfying. I haven't quite gotten into the habit of preparing for the week as I should. Some things take more prep time and if I am starving, I settle for something quick and easy. If I prepared two or three dishes from the huge collection of recipes - maybe one or two breakfast recipes and one or two main dishes - and cut up a bunch of veggies and make some sauces and dips - I'd be all set for the week - but I don't plan ahead and so I eat a lot of the same foods. But it doesn't really bother me - they are foods I like. I found certain stores with certain brands that I can buy prepared foods. Harmon's has a couple of their deli hummus varieties that have no oil and all WFPB ingredients, so I love to get those ready-to-eat dips. They also have their own deli salsa with all WFPB ingredients that I like and so I get those too! There are some vegetable broths, fat-free refried beans, frozen veggies, frozen fruit that I like, they are all cut up and ready to go. I make a big pot of brown rice (with some black wild rice and red flax seeds thrown in for color) and I add dried onions, garlic, maybe some dill to the pot as well - then when it is done, I divide it into four portions in baggies and freeze them. I've done the same thing with a pound of pasta. This makes prep more grab and go than otherwise. I bought some new gadgets and small appliances to make life easier. Folks - this is a life change. This is not a temporary weight loss program. So, with that in mind, I didn't mind spending some cash on things that I would be using for the rest of my life. Once I'd laid out that money, my actual grocery bills are much less and I hardly ever eat out so my overall food budget is much smaller. WAS IT HARD TO GIVE UP OLD FAVORITES? The first month you are encouraged to eat as much as you want of approved foods - and since I love pasta and rice and potatoes and tortillas, that's what I ate - these are satisfying foods and I really didn't find myself craving sweets. I did miss the richness of dairy and fat more than sugary stuff. But Julie Marie promised if we soldiered through 30 days, we would lose our longing for sweets and rich fats and find WFPB foods very satisfying. I was skeptical about that. But, she was right. I think it took me a little longer, but I am OK with the tofu-based "mayonnaise" and "sour cream" - and oh, one of the things she uses to give a cheesy flavor to her recipes is brewers yeast or nutritional yeast - and it really does get to be very satisfying in short order. Yesterday I watched Dr. Mercola make up a recipe of chocolate candy - he was so awkward on screen and it seemed more like a science experiment than a cooking demonstration - Julie Marie is awesome in the kitchen - she is great on screen and every recipe is delectable and designed to satisfy your well established food longings - THAT is the KEY to the success of this diet. It tastes GREAT and satisfies you. It is anything but bland. 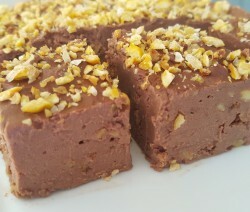 She adds a couple new recipes every week, including this beautiful FUDGE recipe! And it is important to know that Julie Marie was obese with a long list of frightening health problems before she started this and perfected the diet and recipes. She loved all kinds of food and totally understands where people are coming from. So her weekly online classes / webinars are all about helping you with some aspect of this life change - including simply educating you on why it is important, how to stock your kitchen and shop, how to deal with all sorts of challenges, and of course, how to prepare great healthy food. To me, it isn't enough, though it is important, to know WHY you should toss your Standard American Diet (SAD) - that is good motivation, but, the practical application of it is where people get in trouble and give up. That is why I don't think it is any problem at all to pay a subscription fee to access all her educational videos and wonderful recipes. They are significantly different from anything you will find anywhere else on the internet, and so it is a great resource. I am not going to tell you this is the only diet anyone should follow - plenty of people have had much success on a variety of food plans. But I know that for me, it is a very good plan that I can live with long term and I am enjoying not only weight loss but a lot of other benefits. I felt guided to it. I feel like I can live this way the rest of my life and I really am beginning to have no response to old foods I loved that I now know are very dangerous to me. I couldn't really imagine honestly not wanting them. It is more and more true all the time. I have a long way to go to even really fully implement it, many habits I have yet to establish that will make it even more effective and my life easier, and I will keep at it till it is totally natural for me to plan and prepare my food in advance.